1.1 WHAT DO WE KNOW ABOUT BAREFOOT RUNNING? Despite the benefits of footwear, interest in barefoot running has increased among the running community, with proposed benefits including a decreased injury rate. Advocates tout the evolutionary success of man as a barefoot bipedal runner. There is also speculation that the development of modern footwear and the associated altered running gait patterns (including a hindfoot strike versus the forefoot or midfoot strike typical of unshod runners) have contributed to injuries seen in runners.The term(minimalist shoe) is one that provides "minimal interference with the natural movement of the foot, because of its high flexibility, low heel to toe drop, weight and stack height, and the absence of motion control and stability devices." Most studies indicate that running in minimalist shoes results in a lower physiological energy cost than running in conventional shoes, likely because of the lower weight of the minimalist shoe. Shoes limit proprioception: Sensory feedback from the plantar surface of the foot works as an adaptation for sensing characteristics of the ground including hardness, roughness, unevenness, and the presence of potentially dangerous objects such as sharp rocks. Plantar proprioception activates reflexes and helps the central nervous system make decisions that help increase stability and avoid injury. Modern shoes with elevated heels, stiff soles, cushioning, and arch support may either facilitate or encourage a different running form than appears to be common among habitual barefoot runners. Shoes can contribute to weak and inflexible feet, especially during childhood when the foot is growing. Most studies of barefoot running were conducted by asking habitually shod runners to take their shoes off in a laboratory.However,using only habitually shod runners to study barefoot running is problematic because one cannot expect such subjects to have developed the musculoskeletal adaptations and kinematic habits of habitual barefoot runners.Barefoot runners have more variable kinematics than shod runners because they experience more proprioception from their feet.It is also important to emphasize that all runners, barefoot and shod, vary in their form depending on a wide range of conditions such as speed, surface texture, surface hardness, and fatigue. There is an evidence suggests significant differences in morphology between different ethnicities . Barefoot runners often land on the fore-foot (fore-foot strike) before bringing down the heel, but they sometimes land with a flat foot (mid-foot strike) or, less often, on the heel (rear-foot strike).However.shod runners mostly rear-foot strike,due to the elevated and cushioned heel of the modern running shoe.Kinematic and kinetic analyses show that even on hard surfaces, barefoot runners who fore-foot strike generate smaller collision forces than shod rear-foot strikers.Fore-foot- and mid-foot-strike gaits were probably more common when humans ran barefoot or in minimal shoes, and may protect the feet and lower limbs from some of the impact-related injuries now experienced by a high percentage of runners. Shorter stride length and high stride frequency for bare foot runners. moderate evidence that barefoot running is associated with reduced peak ground reaction force (GRF), increased foot and ankle plantarflexion and increased knee flexion at ground contact compared with running in a neutral shoe. Limited evidence indicates barefoot running is associated with reduced impact GRF, reduced peak knee flexion and varus joint moments, and a higher stride frequency compared to a neutral shoe. Very limited to limited evidence also indicates power absorption at the knee is decreased while being increased at the ankle whilst barefoot running. Additionally, the effects of barefoot running on loading rate appear dependent on strike pattern adopted, with a forefoot strike pattern found to reduce loading rate, whilst a rearfoot strike pattern increases loading rate when running barefoot compared to shod. However, there was some methodological weakness in this study needed to be covered in the future research. ↑ Wilks DC, Winwood K, Gilliver SF, Kwiet A, Chatfield M, Michaelis I, Sun LW, Ferretti JL, Sargeant AJ, Felsenberg D, Rittweger J. 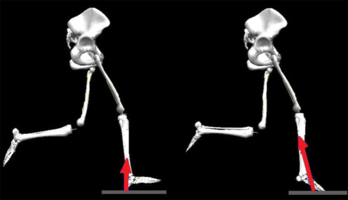 Bone mass and geometry of the tibia and the radius of master sprinters, middle and long distance runners, race-walkers and sedentary control participants: a pQCT study. Bone. 2009 Jul 1;45(1):91-7. ↑ Hreljac AL, Marshall RN, Hume PA. Evaluation of lower extremity overuse injury potential in runners. Medicine & Science in Sports & Exercise. 2000 Sep 1;32(9):1635-41. ↑ Hanson NJ, Berg K, Deka P, Meendering JR, Ryan C. Oxygen cost of running barefoot vs. running shod. International journal of sports medicine. 2011 Jun 1;32(6):401. ↑ Giuliani J, Masini B, Alitz C, Owens LB. Barefoot-simulating footwear associated with metatarsal stress injury in 2 runners. Orthopedics. 2011 Jul 1;34(7):e320-3. ↑ Knapik JJ, Orr R, Pope R, Grier T. Injuries And Footwear (Part 2): Minimalist Running Shoes. Journal of special operations medicine: a peer reviewed journal for SOF medical professionals. 2016;16(1):89-96. ↑ 6.0 6.1 6.2 Altman AR, Davis IS. Barefoot running: biomechanics and implications for running injuries. Current sports medicine reports. 2012 Sep 1;11(5):244-50. ↑ Shu Y, Mei Q, Fernandez J, Li Z, Feng N, Gu Y. Foot morphological difference between habitually shod and unshod runners. PloS one. 2015 Jul 6;10(7):e0131385. ↑ Lieberman DE, Venkadesan M, Werbel WA, Daoud AI, D’andrea S, Davis IS, Mang’Eni RO, Pitsiladis Y. Foot strike patterns and collision forces in habitually barefoot versus shod runners. Nature. 2010 Jan;463(7280):531. ↑ Squadrone R, Gallozzi C. Biomechanical and physiological comparison of barefoot and two shod conditions in experienced barefoot runners. J Sports Med Phys Fitness. 2009 Mar 1;49(1):6-13. ↑ Bishop M, Fiolkowski P, Conrad B, Brunt D, Horodyski M. Athletic footwear, leg stiffness, and running kinematics. Journal of athletic training. 2006 Oct;41(4):387. ↑ Hatala KG, Dingwall HL, Wunderlich RE, Richmond BG. Variation in foot strike patterns during running among habitually barefoot populations. PloS one. 2013 Jan 9;8(1):e52548. ↑ Hall JP, Barton C, Jones PR, Morrissey D. The biomechanical differences between barefoot and shod distance running: a systematic review and preliminary meta-analysis. Sports Medicine. 2013 Dec 1;43(12):1335-53.